In Brussels, Be Kind ... Or Be Fined A new law in the Belgian capital outlaws racist, homophobic and sexist insults, as well as other incivilities such as not cleaning up after your dog. The law allows for the fines — as high as $320 — to be collected quickly. Tired of boorish behavior, the mayor of Brussels pushed for a new law that imposes stiff fines for infractions ranging from sexist, racist or homophobic comments to failing to clean up after your dog. 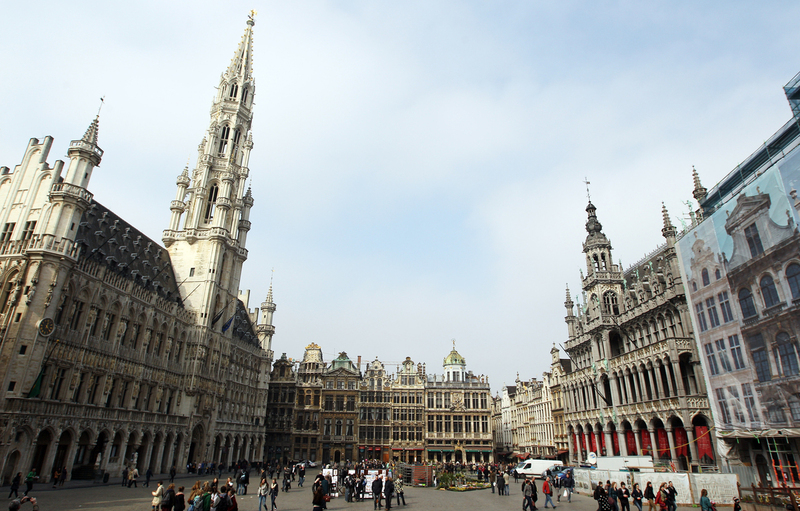 The Grand Place in downtown Brussels can be a feast for the senses: the wafting scent of hot waffles, shop windows chock-full of chocolate, exquisite Baroque architecture. But that's not all you'll find on the quaint cobblestone streets as the city that serves as both the capital of Belgium and the headquarters of the European Union. There's also puke, dog poop, trash, spit, drug addicts, drunks and brawls. Henk Everaert is an undercover police officer whose main job is to nab graffiti artists. But, like other Brussels cops, he's increasingly on the lookout for what the law refers to as "incivilities." That includes people who are too loud or who are urinating in public — as well as those who are insulting others with homophobic, racist or sexist comments. The Belgian capital has launched a new push to clean up bad behavior in public. Now, the city can fine perpetrators up to 250 euros, or about $320, and collect quickly instead of sending the case through the court system, which could take months or even years. Brussels Mayor Freddy Thielemans says he sought the added powers because he had had enough of the bad behavior. "That in front of a policeman," he says, "you'd dare pee on the street and not have any sanctions." Thielemans, whose City Hall office is a 15th-century Gothic landmark, says while this was always punishable behavior, there had been a sense of impunity because it was not a priority in the judicial system. He says that undermined the impact of punishment and demoralized his police officers. "They felt so frustrated they didn't look at it any longer," Thielemans says, "and I thought this is very dangerous." Experts say that allowing even minor "uncivil behavior" to go unchecked can lead to more serious offenses. Elke Devroe, a professor of criminology, has researched Brussels and other big cities for decades and says it's the little things that make residents feel afraid — and criminals feel welcome. She explains that while it's well-known in criminology as the "broken windows" theory, her statistics show dog droppings on sidewalks rank first as an instigator of insecurity in Belgium. "If you are disturbing your neighborhood even with the smallest signs," Devroe says, "then people are feeling unsafe because they think, experiencing in an unconscious way, that other kinds of crime are coming up next to their doors, next to their houses." Officer Everaert says he believes fining incivilities is effective. "Once they have to start reaching for their checkbook, they start changing their behavior," he says. An activist against street harassment, Angelika Hild says sanctions won't address what she calls Brussels' shocking level of random aggression, usually against women. These are acts hard to prove to authorities, she says, such as suggestive staring, whistling, kissing noises, sexual comments and insults. "It's good that the government acknowledges the problem," Hild says. "But practically, the fines won't solve the problem because what is the root cause? It's sexism, homophobia and so on." Hild has started a Brussels chapter of Hollaback, an international online organization empowering women to report and fight back against street harassment. Mayor Thielemans says he's emphasizing awareness programs and at least the fines he'll collect will pay for the extra labor it will take to process them. He'll break even for now, but hopes to break bad habits in the long run.